Owning a property comes with multiple responsibilities. One such burden that a homeowner in Westfield has, is the replacement of a furnace at regular intervals of time. While it turns out to be a tricky task to figure out the best time to replace an old furnace, the trick is to calculate the operating costs of the system each month and check if a replacement would work out cheaper. Usually, when heating systems get old, they consume more energy and require repairs very frequently. 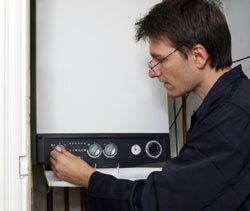 Even if your heating system is working well, it is best to replace it once it has 'lived' for fifteen years. Changes in technology take place at a rapid pace and fifteen years works out to be the ideal time to make changes to your heating appliances. If the system is older than ten years, you could opt to replace it with a new one. Of course, you will spend some money as well, but you'll at least get something out of the old one. If you replace or swap your old heating pump before it crosses the ten year mark, you will have the potential to save almost 20 percent on your heating bill. It's better to do so than wait for it to quit working once and for all. If your furnace requires repairs on a regular basis, it is better to sell it or exchange it for a new one, even if it is just around ten years old. Otherwise, costs will increase every time you contact a service provider in Westfield and even your bills will shoot up. Furnace Repair, Maintenance and Installation Service throughout Westfield, Clark, Scotch Plains and Central New Jersey.